Here is a special way to enjoy your favorite photos. 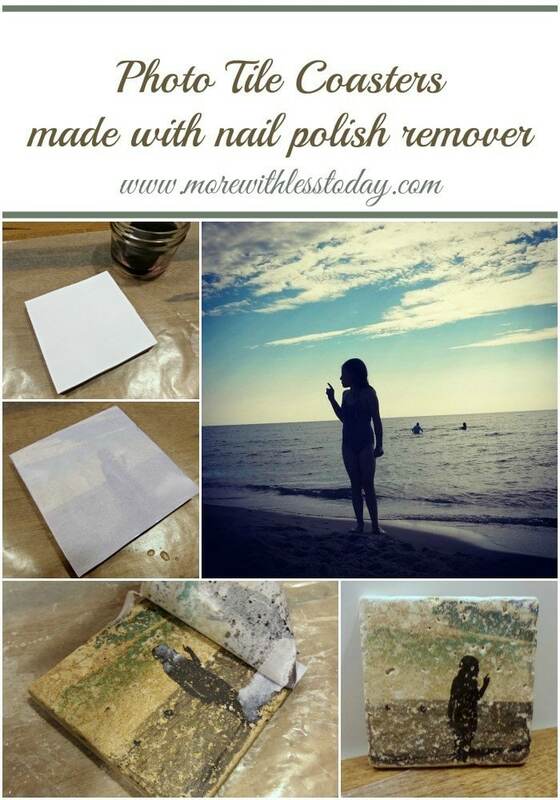 You can make photo transfers using nail polish remover and make photo tiles. These are inexpensive to make using just a few supplies. Follow the easy steps and make a set for yourself and some for gifts. If you are like me, most of your photos are on your smartphone. This is a way to enjoy those memories with a set of photo tile coasters. You can use your holiday photos to make gifts to give for all holidays including Christmas, Mother’s Day, Father’s Day, graduation, weddings, birthdays, holidays or special occasions. Be sure and share your finished project with us! tile sealer – I used Aquamix Enrich-n-Seal in quart size. I made several sets to give as gifts. It also comes in pint size. Note: The paper copies need to be made on a copy machine or printer that uses TONER not ink. This will not work properly with ink or laserjet printers. Most local office stores or local printing companies use toner. Because the image will be transferred face down, consider reversing the image before printing it so words and such face the correct direction on the finished tile. Begin by cutting your photo to the same size as the tile you are using. It can be slightly larger as the excess paper will rub off. Turn your photo face down on top of the tile. Cover the photo and tile with the sheet of acetate and use the knife of boning tool to rub across the acetate. The acetate protects the photo while you rub and apply pressure. It takes time, elbow grease, and patience. But, it is so worth it in the end! Continue rubbing the acetate with the knife. Lift the acetate off and apply more nail polish remover. Replace the acetate and continue rubbing. After a few applications of nail polish remover and rubbing, carefully lift the corner of the photo paper to see if the ink is transferring. If it has not completely transferred, repeat the above process. 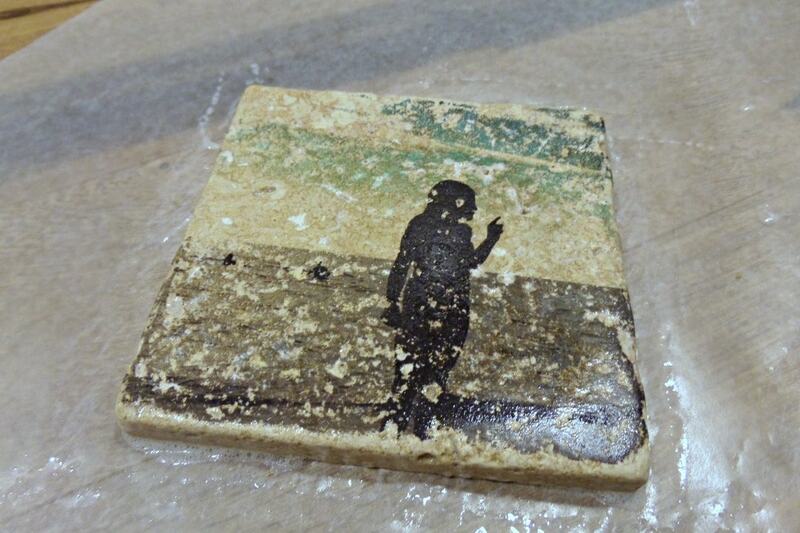 Once the image has transferred to the tile, remove the paper and use your fingers to rub any stuck on paper off. Rinse the tile off and let it dry. In the image below you can see the original photo I used for the tile. I did several tiles using different photos but the photos with darker and more contrasting colors turned out the best. To finish the tile, apply a coat or two of tile sealer over the image. 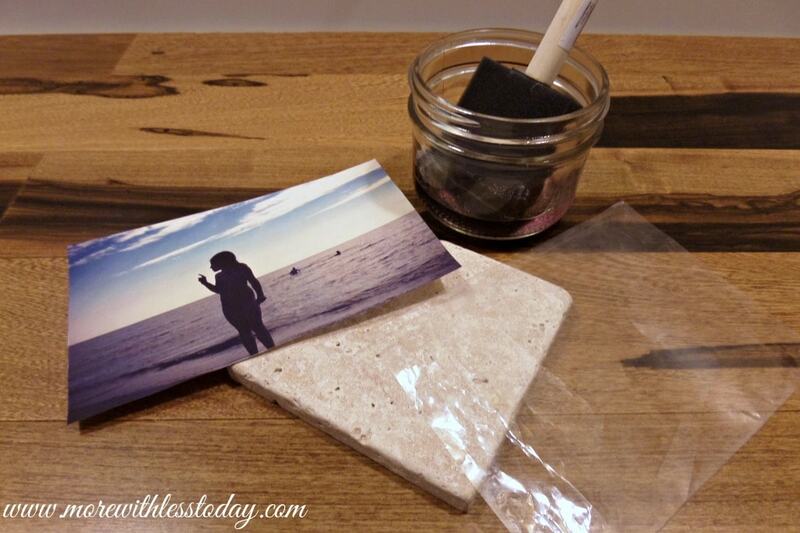 When the sealer has dried, stack the set of photo coasters together and tie a piece of ribbon or twine around them. They will make a beautiful and meaningful gift! What type of paper does your photo have to be on? We used regular copy paper but this is important: Note: The paper copies need to be made on a copy machine or printer that uses TONER not ink. This will not work properly with ink or laser jet printers. Most local office stores or local printing companies use toner. Because the image will be transferred face down, consider reversing the image before printing it so words and such face the correct direction on the finished tile.